Stretch your students' creativity with my free "Battle of the Fictional Couples" tournament bracket activity! 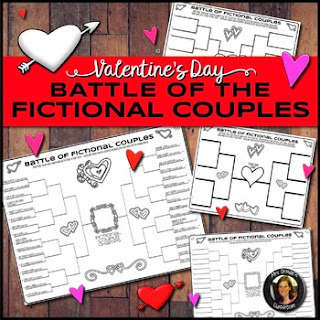 Students decide which fictional couples (or duos) would take first place in a make-believe tournament. The activity encourages creativity, debate, reading, and (optional) writing skills. It can be used as a bell-ringer or exit slip, group project, or just a fun activity to play on Valentine's Day.